Introduction and Study Design: Spinal arachnoid cyst is an uncommon entity, presenting with radiculopathy or paraparesis. These cysts are usually found in intradural extramedullary region; and the extradural region is a rare location. The exact pathogenesis in the existence of these cysts in the extradural region is still debated. In this article, we have retrospectively analyzed the clinical profile of the rare extradural arachnoid cyst (EDAC). Methodology: In this study, 19 patients of EDAC operated at our institute between January 2006 to June 2016 are analyzed. All patients with the Oswestry disability index score of >20 were managed surgically (open laminectomy and cyst excision). The clinical outcome was assessed at using 5-point satisfaction scale and McCormick grading. Results: All 13 operated patients had EDACs with communication with the intradural compartment. In 11 (84.6%) patients, cyst wall was excised completely, in 2 (15.3%) patients underwent partial excision of cyst wall; dural communication was closed in all patients (n = 13). None of the patients had clinical deterioration or radiological recurrence till the last follow-up. Mean follow-up was 52.2 months (range 1–160); all patients were satisfied after surgery (median score was 3). Discussion: Symptomatic EDACs account <2% of all spinal tumors. The EDACs have communication with the intradural compartment. In our article, we have discussed the approach and management of EDAC, including minimally invasive percutaneous procedures. Conclusion: One should aim for preoperative or intraoperative localization of dural communication and try to disconnect the extradural cyst from the intradural connection to prevent recurrence. Surgical treatment is complete excision of the cyst. Arachnoid cyst in extradural location is a rare etiology of compressive myelopathy. Most of these cysts are asymptomatic and detected incidentally. The lower thoracic spine is the most commonly reported site; although, rare cases have been reported from lumbar, lumbosacral, and cervical region also. Most of these lesions are considered congenital in origin. Other etiologies of trauma, inflammation, and infection have also been proposed. The exact pathogenesis of these cysts is still debated; they are believed to arise as herniation of arachnoid from small defect in the dura. Then, gradual enlargement of these cysts forms symptomatology of cord compression. Extradural arachnoid cyst (EDAC) is of two types (may have a pedicle or sessile connection it to subarachnoid space). With few such cases reported in the literature, exact incidence is difficult to comment on. In this article, we present our institutional experience of EDAC and review management options and surgical nuances to prevent recurrence. The article is written according to the Strengthening the Reporting of Observational Studies in Epidemiology Statement guidelines. Individual consent from the patient to use clinical and radiological details for publication was taken as per our department policy. We have retrospectively evaluated 19 patients of EDAC presented at our institute between January 2006 and June 2016. The data regarding demographic profile, symptomatology, McCormick disability scale, the location of the cyst, surgical findings, and postoperative complications were recorded from hospital records. Individual consent from all patients was obtained for surgery and publication of clinical details. “Primary cyst” was defined as the presence of cyst in cases operated for the first time, whereas “Recurrent cyst” was defined when the patient was operated for second or third time. The dural communication was termed “superior” if the position lies above midway along the length of cyst and “inferior” when the position lies below midway along the length of the cyst. The cyst was sent for histopathology examination and any evidence of blood was noted. None of the patients had hemorrhagic cyst as content, and hence, evidence of capillary proliferation was considered as a marker of previous trivial trauma. Patients were categorized on the basis of the Oswestry disability index (ODI). Minimally symptomatic patients with ODI <20 were managed conservatively, whereas symptomatic patients with ODI >20 were managed surgically. Patients underwent laminectomy and excision of the cyst with the closure of communication of cyst with the intradural compartment. The clinical outcome at last follow-up was assessed using 5-point scale (satisfaction score) and McCormick grading. 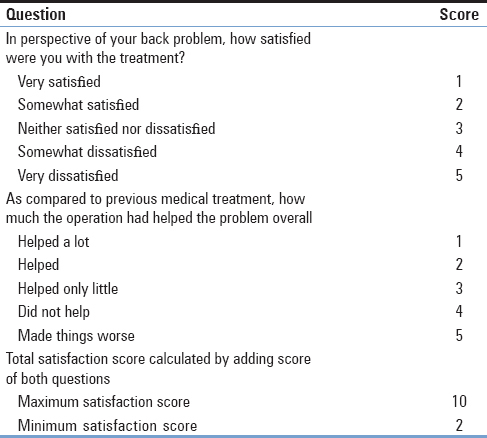 Patients were asked two questions similar to Core Outcome Measures Index (COMI) question 10 and 11: “In the perspective of your back problem, how satisfied were you with the treatment?” and “As compared to previous medical treatment, how much the operation had helped the problem overall.” [Table 1] shows the total satisfaction score of both questions after surgery. Last follow-up was noted telephonically and as outpatient clinic basis. The Statistical Package for the Social Sciences version 22.00, International Business Machines Corporation (IBM), Armonk, New York, USA, was used for statistical analysis. Out of 19 patients, 6 patients with ODI scores of <20, both at first visit and subsequent follow-up, were managed conservatively. Twelve patients with ODI more than 20 were managed surgically; 1 patient with initial ODI of 10 but subsequently worsened (ODI = 24) in the course of follow-up was operated [Figure 1]. Therefore, we hereby discuss all surgically managed (n = 13) in this study [Table 2]. Mean age was 25.76 years (range 14–60; n = 3 with age > 40 years) (8 M: 5 F). Out of 13 patients, 7 (53.8%) patients had lower dorsal region cyst (below D6), 2 (15.3%) patients had upper dorsal cyst (above D6), and 4 (30.7%) patients had lumbosacral cyst. The dural rent was found in all patients, 3 (23%) had communication along nerve root sleeve and remaining 10 (76.9%) had communication at dorsal surface. Mean ODI of 13 patients was 26.9 ± 2.4 (24–30) (median 28); mean McCormick scale was 2.8 (median 3). 3 (23%) had flaccid paraparesis and 6 (46.1%) had spastic paraparesis. Six (46.1%) patients had severe motor deficit (power below 3/5), 5 (38.4%) had mild weakness (power 3–4/5) and 2 (15.38%) patients had no motor weakness. Six (46.1%) patients had sensory deficit, whereas remaining 7 (53.8%) had no sensory involvement. Similarly, 7 (53.8%) patients had radicular pain, whereas 6 (46.1%) had diffuse, dull aching back pain. In our series, only 2 (15.3%) patients had overall severe neurological deficit with a severe motor deficit, sensory and bladder involvement. Three (23%) patients in our series presented as “Recurrent cyst.” On retrospective analysis of previous operation notes, we found that all three patients underwent cyst excision without closure of dural communication. During resurgery, we found the dural communication at the dorsal surface and closed it. These three patients had motor deficit (n = 2, 0–1/5 and n = 1, 3/5). All three patients were female (2 had lower dorsal region cyst and 1 had lumbosacral cyst). These patients also had bladder involvement at presentation, which persisted in the postoperative period also. Eleven patients underwent complete excision of the cyst and in two patients' partial excision was done (due to dense adhesions). These partially excised cysts were located at lower dorsal in the first and lumbosacral region in second). Dural communication was closed in all patients. None of the patients had clinical deterioration or radiological recurrence till last follow-up. Mean follow-up was 52.2 months (range 1–160) with three patients <3 months FU. On histopathology, in the majority of patients, we found the fibrocollagenous wall. Four patients had proliferation of capillaries, 2 patients had hemorrhage, 2 patients had inflammatory infiltrates, and 1 patient had epithelial proliferation. Among 3 patients with recurrence, 2 had proliferation of capillaries. Mean postoperative COMI satisfaction score was 3.2 (median 3). There was a trend suggesting less satisfaction score in patients with poor McCormick Score and more ODI score. Spinal symptomatic EDACs are a rare clinical entity, commonly located in the lower thoracic region., It accounts for <2% of all spinal tumors, presents as an uncommon etiology of compressive myelopathy. Nabors classifies EDAC as type IA spinal meningeal cyst. Dorsally located cysts are more common than ventral, either single level or multiple level involvements. None of the 13 cases in our series had ventral located cyst. In the series of seven cases, Kulkarni et al. reported a rare case of extradural cyst located anterolateral. The presence of the dural defect in EDAC, as one-way communication with intradural space, needs necessary identification of defect along with the excision of the cyst. The exact etiology is still debatable; traumatic or congenital (mutation in the FOXC2 gene) being most accepted. Contrary to our belief, none of the patient in our series had previous history of arachnoiditis or spinal surgery. In addition, only two patients had a history of trauma. None of our patients had curvature anomaly including juvenile dorsal kyphosis or Scheuermann's disease; although both of these are reported in the literature. The age distribution in our series further decreases the possibility of congenital origin. We believe idiopathic origin to be most likely etiology. Kulkarni et al. proposed that the cyst wall itself may be responsible for the production of CSF or absorption of CSF from the subarachnoid space. These cysts usually present with backache or radicular intercostal thoracic or leg pain. Pain is progressive and associated with paraesthesia of related region limbs and subsequently worsens to spastic or flaccid paraparesis or quadriparesis. The cyst present in the thoracic region becomes symptomatic early in comparison to lumbar region cyst due to the narrower canal in the dorsal region. The motor weakness is usually more common than sensory or urinary involvement. Cases presenting with acute paraplegia have been reported due to herniation of the spinal cord through the dural defect into the EDAC; although all our cases had benign progression [Table 3]. Lumbar region cyst attains a larger size and usually presents with low back pain due to persistent pressure of growing cyst on nearby pain generators. Recurrent cysts tend to present more often with bladder symptoms. Sensory numbness may be present on examination. Sometimes, the progression in waxing and waning type and backache fluctuates with coughing possibly due to ball valve mechanism at the dural defect. The EDAC are usually misdiagnosed or diagnosis is delayed. The duration of symptoms varies with the location of the cyst with overall slow progression. The thoracic cysts present earlier when compared to lumbar cysts. In our series, patients with cyst located at thoracic level had mean 154 ± 20 standard deviation (SD) days of clinical presentation, whereas patients at lumbar level had mean 320 ± 84 SD days of presentation. Funao et al. also showed a similar pattern of presentation in their series. Magnetic resonance imaging is the investigation of choice for these cysts. Magnetic resonance imaging (MRI) shows characteristic CSF like intensity in both T1WI and T2WI [Figure 2]. It can also highlight surrounding bony changes and relation of cord or cauda with EDAC. We advise contrast sequences to see for cyst wall enhancement. With advancement in MRI sequences, now we can ascertain size, number and even exact level of dural defect. Miyamoto et al. and Doita et al. have demonstrated dural defects by using myelogram and Kinematic MRI sequences., Neo et al. suggested that cine MRI and dynamic sequences are not always helpful and one may need computed tomography myelography sequences to localize the defect. Nakagawa et al. recently proposes constructive interference in steady-state imaging as a better tool to localize. We did not have such special sequences MRI in our series, being retrospective analysis. On MRI absence of extradural fat, cord atrophy or myelomalacia are other rare features to be searched for. Parasitic cyst including cysticercosis or hydatid cyst must be kept in differential diagnosis especially in patients of the Indian subcontinent. The signal within the cyst may appear hyperintense compared with the CSF in the spinal canal because of the higher protein content of the cyst fluid. EDAC are benign expanding lesions, which widens the spinal canal, thinning surrounding bone and characteristically present with scalloping the posterior plate of the vertebral body and increased interpeduncular distance. It displaces the spinal cord and cauda roots anteriorly or laterally. Indication of surgery in the asymptomatic cyst is controversial. We managed all patients according to ODI. The curable nature of disease intrigues surgeon to explore various therapeutic options. For symptomatic cyst, laminectomy with excision of cyst followed by localization and ligation of the dural defect is standard of care. The lesser invasive approach of laminoplasty seems better option, especially in the younger population. Previous studies suggest that there is the lesser incidence of postoperative kyphosis after laminoplasty, but Lee et al. suggested that laminoplasty is difficult to at the thoracic and lumbar level because the pedicles have a tendency to fracture due to their anatomical structure. Lee et al. reported kyphosis deformity even after laminoplasty. Some authors even propose conservative symptomatic management with radiological follow-up, especially in pediatric cases due to additional risk of post-surgical deformity. The risk of spontaneous cord herniation leading to acute paraplegia must be weighted with conservative plan. Laminoplasty is alternative in young patients although we did laminectomy in all our patients and none had any complication. The authors believe that postoperative kyphosis may occur even after laminoplasty of more than five levels. In our series, there were two patients with five or more level laminectomies and none had such spinal deformity in follow-up. In cases of postoperative progressive kyphosis, arthrodesis is advised. A prospective study with longer follow-up, might conclude on the need of laminoplasty over laminectomy. Previously, the cystoperitoneal shunt was one of the management options. There is a high risk of recurrence with such shunting either with standard open laminectomy or even with CT or MRI guidance percutaneous. With increasing armamentarium in minimally invasive spine surgery, selective laminectomy and closure of dural defect are emerging option. Partial excision of cyst has also been reported as the option with low rate of recurrence. Lee et al., in their study, inferred that recurrence is related to inadequate closure of dural defect, rather complete or partial excision. Out of three recurrent cases in our series, the dural communication defect was not closed in primary surgery in all three. The importance of dural defect identification and closure has been highlighted in many studies. Kumar et al. reported no recurrence in their series with the closure of dural communication. Sometimes in long-standing or recurrent cyst total excision of cyst wall with dural closure is necessary as cyst wall can thick bands around thecal sac, which will prevent expansion of thecal sac. In our series, there was also no recurrence during the 42-month follow-up., In terms of patient perspective, postoperative satisfaction questionnaire highlighted that majority of patients were “very satisfied” and surgery “helped” them in regaining normal life. On histopathology examination, the secretory epithelium could not be appreciated. We want to emphasize the fact that there is no difference between intradural or EDAC. The proliferation of capillaries and inflammatory infiltrates may be indirect evidence for the history of trauma or infective etiology, but the conclusory remark is difficult. We also found the presence of epithelium (n = 1) and hemorrhage in two patients. We could not find any difference between primary and recurrent cyst. The cyst wall may be single layered or double layered. Outer layer in the fibrous sheath and the inner layer is arachnoid lining. The inner arachnoid lining may be absent. Other studies found similarly, that the cyst walls contain only calcified tissue and layered collagenous fibers without evidence of the glands or secreting tissues. Other findings of spinal arachnoid cysts usually reveal a thick fibrous connective tissue of the outer and inner wall of the arachnoid membrane. The hemosiderin, detected in the cyst wall may suggest a traumatic origin. However, we did not analyze such changes in the secretory properties of the tissues in our series. 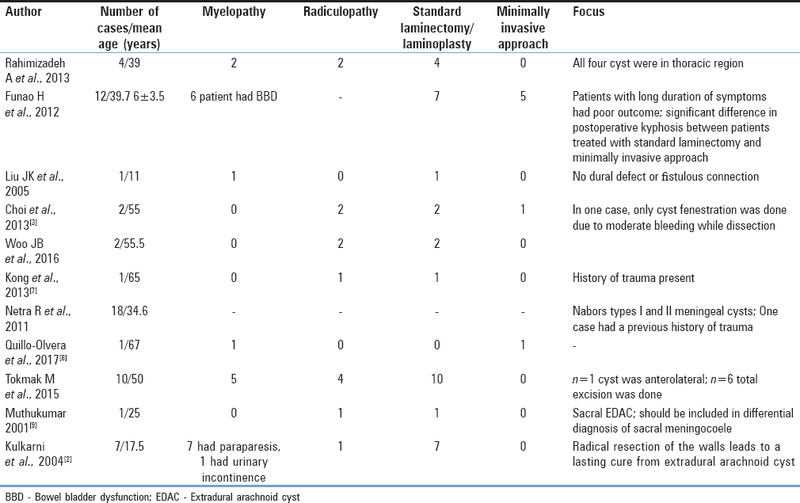 The symptomatic EDAC presents with spectrum of symptoms ranging from compressive dorsal myelopathy to radiculopathy. The dural communications should be searched and separately sutured to prevent recurrence. Preoperative radiological localization of dural rent is helpful. Laminectomy with complete excision is standard care, but the trend toward selective closure of dural communication without even cyst excision is emerging. Choi JY, Kim SH, Lee WS, Sung KH. Spinal extradural arachnoid cyst. Acta Neurochir (Wien) 2006;148:579-85. Kulkarni AG, Goel A, Thiruppathy SP, Desai K. Extradural arachnoid cysts: A study of seven cases. Br J Neurosurg 2004;18:484-8. Choi SW, Seong HY, Roh SW. Spinal extradural arachnoid cyst. J Korean Neurosurg Soc 2013;54:355-8. Nabors MW, Pait TG, Byrd EB, Karim NO, Davis DO, Kobrine AI, et al. Updated assessment and current classification of spinal meningeal cysts. J Neurosurg 1988;68:366-77. Hakky MM, Justaniah AI, David C, French RJ, Martin D, Kwok N, et al. The neuroimaging spectrum of septum posticum derangement and associated thoracic myelopathy. J Neuroimaging 2015;25:818-23. Liu JK, Cole CD, Kan P, Schmidt MH. 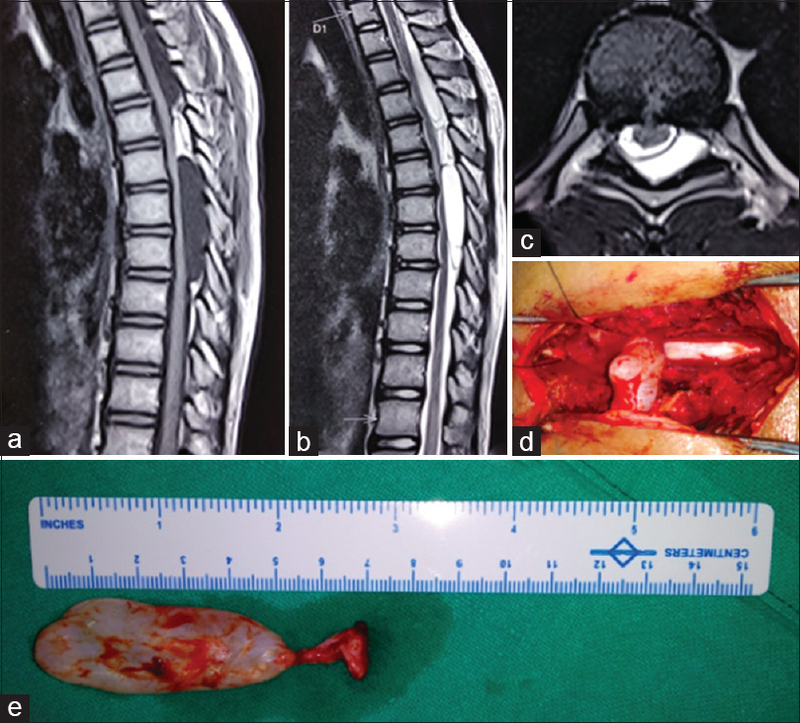 Spinal extradural arachnoid cysts: Clinical, radiological, and surgical features. Neurosurg Focus 2007;22:E6. Kong WK, Cho KT, Hong SK. Spinal extradural arachnoid cyst: A case report. Korean J Spine 2013;10:32-4. Quillo-Olvera J, Quillo-Reséndiz J, Gutiérrez-Partida CF, Rodríguez-García M. Spinal extradural arachnoid cyst: A case report and review of literature. Cir Cir 2017;85:544-8. Muthukumar N. Sacral extradural arachnoid cyst: A rare cause of low back and perineal pain. Eur Spine J 2002;11:162-6. Funao H, Nakamura M, Hosogane N, Watanabe K, Tsuji T, Ishii K, et al. Surgical treatment of spinal extradural arachnoid cysts in the thoracolumbar spine. Neurosurgery 2012;71:278-84. Garg K, Borkar SA, Kale SS, Sharma BS. Spinal arachnoid cysts – Our experience and review of literature. Br J Neurosurg 2017;31:172-8. Wang MY, Levi AD, Green BA. Intradural spinal arachnoid cysts in adults. Surg Neurol 2003;60:49-55. Miyamoto M, Kim K, Matsumoto R, Isobe M, Isu T. Utility of preoperative magnetic resonance imaging myelography for identifying dural defects in patients with spinal extradural arachnoid cysts: Case report. Neurosurgery 2006;59:E941. Doita M, Nishida K, Miura J, Takada T, Kurosaka M, Fujii M, et al. Kinematic magnetic resonance imaging of a thoracic spinal extradural arachnoid cyst: An alternative suggestion for exacerbation of symptoms during straining. Spine (Phila Pa 1976) 2003;28:E229-33. Neo M, Koyama T, Sakamoto T, Fujibayashi S, Nakamura T. Detection of a dural defect by cinematic magnetic resonance imaging and its selective closure as a treatment for a spinal extradural arachnoid cyst. Spine (Phila Pa 1976) 2004;29:E426-30. 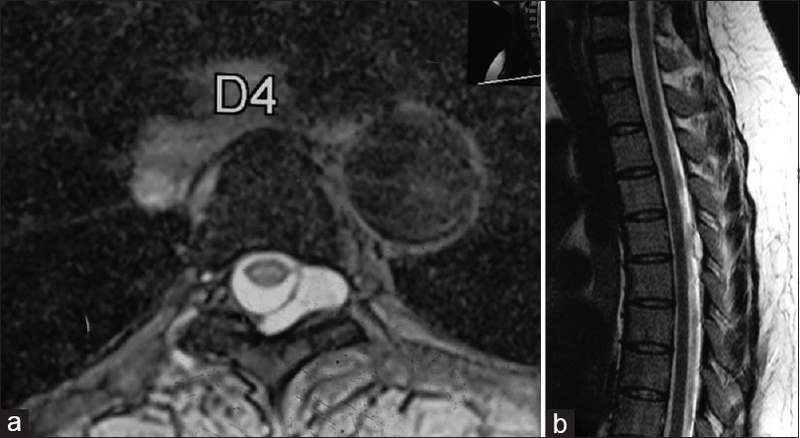 Nakagawa A, Kusaka Y, Jokura H, Shirane R, Tominaga T. Usefulness of constructive interference in steady state (CISS) imaging for the diagnosis and treatment of a large extradural spinal arachnoid cyst. Minim Invasive Neurosurg 2004;47:369-72. Netra R, Min L, Shao Hui M, Wang JC, Bin Y, Ming Z, et al. 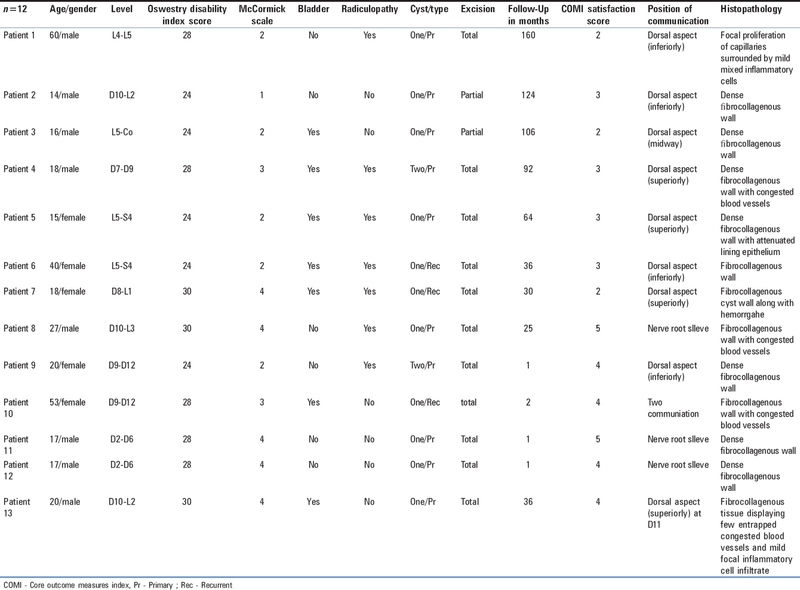 Spinal extradural meningeal cysts: An MRI evaluation of a case series and literature review. J Spinal Disord Tech 2011;24:132-6. Lee CH, Hyun SJ, Kim KJ, Jahng TA, Kim HJ. What is a reasonable surgical procedure for spinal extradural arachnoid cysts: Is cyst removal mandatory? Eight consecutive cases and a review of the literature. Acta Neurochir (Wien) 2012;154:1219-27. Tokmak M, Ozek E, Iplikcioglu AC. Spinal extradural arachnoid cysts: A series of 10 cases. J Neurol Surg A Cent Eur Neurosurg 2015;76:348-52. Kumar A, Sakia R, Singh K, Sharma V. Spinal arachnoid cyst. J Clin Neurosci 2011;18:1189-92. Woo JB, Son DW, Kang KT, Lee JS, Song GS, Sung SK, et al. Spinal extradural arachnoid cyst. Korean J Neurotrauma 2016;12:185-90.